If you would like to book please email to info@afrivista.com or call or Whats app to +27 839623290 . Payment on the day card or cash . Explore the best the Cape Winelands have to offer: lunch in the cellars and get to know the local wineries. Lunch included in the price. The menu consists of a wide range of dishes to choose from! Lunch is served at Le Pommier country restaurant Pick up and drop off at place of residence (Stellenbosch). 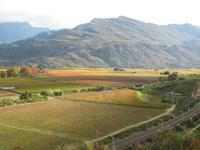 Small fee charged for other towns.We go to 4 wineries in the area of Stellenbosch mainly. Private cellar tour. Tastings included. We also cover the history and culture of the area. Cheese tasting on the day! For direct group bookings more than 10 we give 10% discount! Pick up and drop off at place of residence (Stellenbosch). Three wineries in the Stellenbosch area. 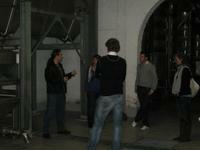 Private cellar tour. Tasting included. History and culture of the area. Morning halfday’s on spesial request . 3 Farms incl. 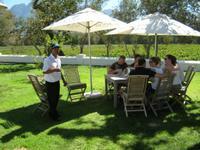 cellar tour and lunch all inclusive Stellenbosch area. Pick up at 11h30 daily. In harvest season (February till begin April) we also drive into the vineyard to see grape picking! show you the main attractions. Private Cellar Tour on every tour.